In the post this today arrived a letter with the results of my test, the one I took last Monday. Part one was placing all of those dots in the symbols. I scored 200/220. I had hoped for better, knowing that I made one mistake I corrected and one that I left (as I didn't catch it until later, so I thought correction wasn't in the spirit of things), but that's a good score considering what was being asked. Part three was the quality control of the galettes (pies, I called them, I think?). Anyway, check they had no bits missing and the right colour and the right barcode/label. For that test I attained a perfect 125/125. I'm really pleased with that! Finally, the pick'n'mix. I am not aware of making mistakes, but part of the test was also screwing up those little yellow bolts, so I don't really know how it was scored... anyway, I got 276/296 for that, which was a nice score also. Let's face it, I am disappointed by the 30/95 score, but if I misunderstood then I misunderstood, can't fix it now. As you can see, overall I did quite well. 631/736 translates to be about 85%. What surprised me was to see the bloke that kept knocking the yellow bolts on the floor having an interview in front of me. Maybe he was spot on in the visual tests and just a little less able in the pick'n'pack? Oh well, let him do the quality control! And today I had my interview with the company. A very friendly woman who asked me the usual sorts of questions. I could have had a job programming the machines that measure out doses of things, but that was 9pm to 5am and if you remember I said I wasn't going to expect mom to drive me on a night shift. I was offered either picking and placing raspberries or pre-packing quality control and I opted for picking and placing the raspberries, if you recall from the final group test I preferred the "putting balls into the tray" part over the "checking the tray" part. I believe it is a four month contract, and I believe it is at least three days a week (hopefully more?). Don't know about weekends. It is astonishing that the ANPE never gave me a paper describing the job and the company didn't spell it out in great detail. I know sort-of what the job involves, but not how much of it I'll be doing! 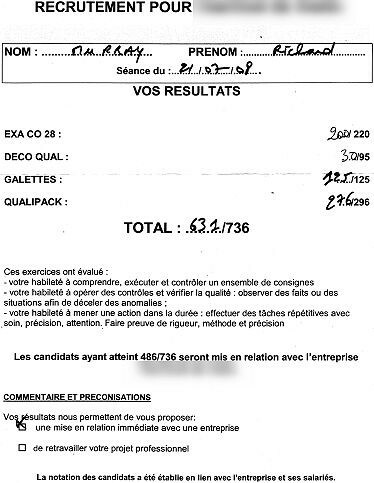 I have a paper that says "Vous êtes embauché à compter du: 8/9/08" (You are hired, to count from 2008/09/08"); it says my job is assemblage (I trust you don't need a translation! 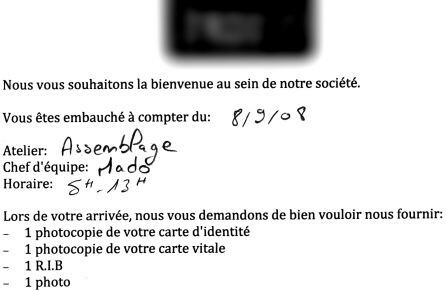 ), my head-person is called Mado (is that some sort of Breton name? short for Madeleine? ), and my hours are 5h - 13h. It also asks I bring copies of ID, bank, and medical, plus a photo of myself. So...? You know...? Do I turn up at 5am on the 8th with all this stuff? I know France is a very beaurocratic country, so I'm expecting half a dozen letters and convocations and stuff before then. If the unthinkable happens and I hear nothing, I will call them at the start of September to confirm. But, like I said, I'd be very very surprised to not have received anything in the post - maybe even something like "here are the the ten golden rules of food preparation: 1. don't pick your nose, 2. don't scratch your balls, 3. don't even think of poking around the posterior region...". During the interview, when there were parts I didn't fully understand, I asked her to repeat more slowly, but made it clear that I wanted as much as possible to be in French - the woman apologised for her bad English; which was a shame because it wasn't actually bad, and she had this amazingly cute English-with-a-very-French-accent way of speaking (the way they tend to speak before they pick up enough inflection to pass as being odd Americans - a lot of Frenchies who speak English seem to have American accents! or: zeh vay zay ten too zpeek beefohrzay peek ahp eenuh eenflekzyon too pazz azz...). I could have listened to that a lot longer, but I didn't think it would be ideal to say "yeah, I like your accent, speak to me in English!" when applying for a job in France! I was asked why I omit my address and other locational details. Given our rural placement, and the fact that anybody could be reading this - from the girl I will one day marry to a raving lunatic hatchet murderer - it does not seem terribly wise to post my details all over the place. Furthermore, while it is sometimes useful to be able to enter a name into the Pages Jaunes and have it show a map of where this is (especially if you are trying to find an itty-bitty ANPE office in a town you've never been to before), it is a bit creepy that you can do this for anybody and it will show you where they live. Complete with optional satellite imagery. Try it - go to http://www.pagesjaunes.fr/ and look for the ANPE in Vitré (postal code 35508). If you switch to the satellite version, I wonder if you can make out what is across the car-park from them. Hint, it's a fast food chain, so look for some sort of idenfication logo, you might be able to make it out on zoom. While you are there, go to the main road and follow it north. Take a peek around Vitré's old town and eyeball the chateau too! Anyway, we have no land-line (yet) and the various companies have not tied the mobile numbers into our address (I know, I looked) so we're off the radar as far as click'n'look goes. Call me paranoid, but I'd rather like to keep it that way. Once I've put aside enough money to pay for a year of internet [about 24 + 16 + 3 * 12; or 500 euros! ], I will get broadband here. Whoo! About time, too! I'm only looking for around 1mbit, don't need TV and while 8mbit is cool, it is a lot more expensive - so my downloads may take eight times longer. It's a lot more realistic than stupid ~33kbps dialup! I want to have my service from Orange, because I have been involved with people who have had other providers where the telephone company wasn't overly interested (it's your ISP's problem) and the ISP wasn't overly interested (it's your phone line). At least if it is all coming from the same place they can't pass the buck like that. To be honest, I don't really need an analogue phone line. Would it work out cheaper to have only the Livebox, and a phone plugged into the Livebox (an 07xxx number?) in preference to a traditional phone setup? Is that an option available, or is that only a city thing? Today's word is discombobulate (dis-com-bob-yew-late); which is a word more common in America and Canada than Britain, it is a lovely word meaning to throw into confusion.